Lazy Loading is the technique of loading the module or data on demand. It helps us to better the application performance and reduce the initial bundle size of our files. The initial page loads faster and we can also split the application into the logic chunks which can be loaded on demand. Basic knowledge of Angular 2+ version. Let us now understand the steps involved in the demo application. Open the command prompt and write the command for creating a new Angular application. We have an option for routing the module by default. The application is created successfully. Now, navigate to the application folder and open the application in VS Code. Now, create a new routing module file using the given command. Here --flat helps to create only TypeScript file without containing our own folder. Now, we are creating two components - home and about - using the below command for demonstration. You can create the components with any name as you like. Here, we are using --module for auto import components to app-routing module. Now, create one more module file for loading on demand. Let us say the name lazy and create one component file with the named employee using the below command. If the above command creates files successfully, then open the app.routing.ts file and import Routes and RouterModule from the @angular/router. Add one constant for defining your routes with the path and component. Here, we used loadChildren load module on the user's demand. Use RouterModule.forRoot with our routes array. Now, in your app-routing.module.ts file, add the following code snippet. 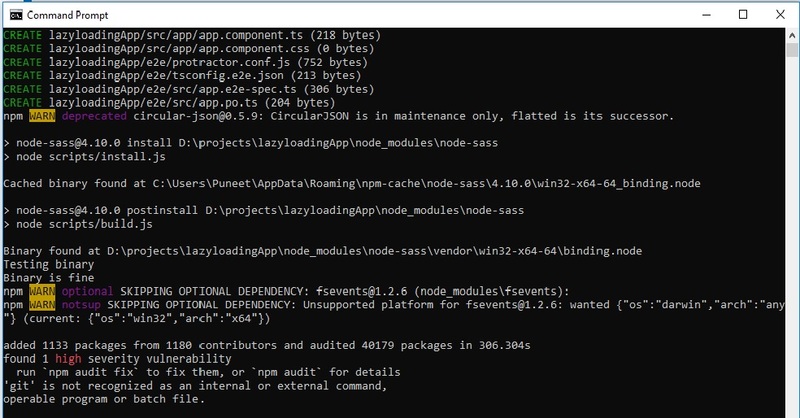 Open the lazy.module.ts file and define components in routes. Then, use RouterModule.forchild with your child routes array. The following code snippet can be used for lazy.module.ts file. Open the app.module.ts file and here, import AppRoutingModule. Your code will look like below. Now, open the app.component.html file. Here, we need to define the routerLink for navigating the links and using router-outlet tag for loading the HTML templete. Now, run the application using the following commands to open in the Chrome browser, enter http://localhost:4200. Open Developers tool, go to the Network tab. Here, you can see that when you click the home or about page, they load the initial bundle files and when clicked on employee list link, the lazymodule file is loaded. Given below is the output image. The first one is an initial load image and the second is lazy module load. I have attached the .rar file of this demonstration. If you want the application code, download it. Use the below command for installing node modules. 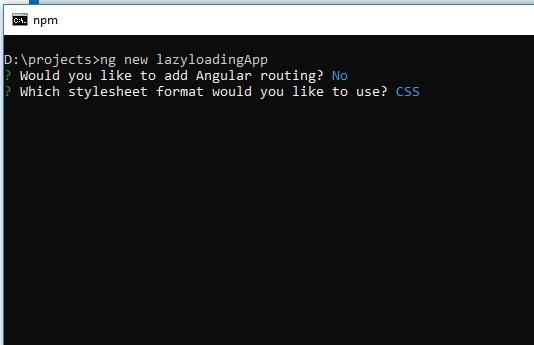 In this article, we learned lazy loading of modules in Angular. Thank you for reading. If you have any questions/feedback, please write in the comments section.